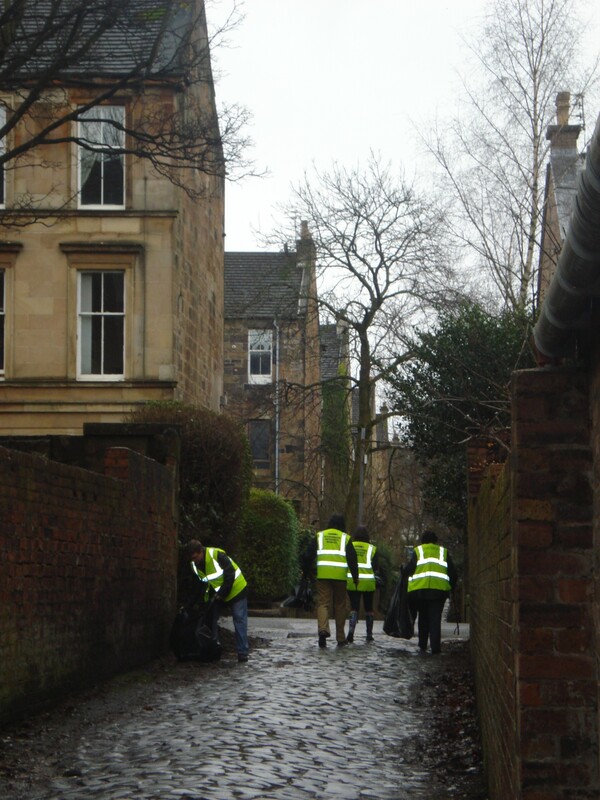 Brighter Bungo is the name the Society gives to our regular community clean-up days. These take place quarterly in partnership with the Clean Glasgow campaign. Volunteers are given high-visibility vests, bin bags, gloves and litter pickers and encouraged to clean up litter and fly-tipped rubbish from the area’s streets and back lanes. Glasgow City Council’s Clean Glasgow campaign provides the equipment and removes the collected waste. It’s a great hands-on way to improve the area we live in and a fantastic way to tackle the niggling issues that annoy anyone who lives in a busy, urban area. As a result of the efforts of volunteers, Brighter Bungo was awarded a Keep Scotland Beautiful Outstanding neighbourhood achievement award in 2012. We had a great turn out for the first event of 2019, with free coffees in the Bungo afterwards. See the calendar or watch the blog for future dates in 2019.
would you believe that the lane next to Bradfords Bakery seems to be the dump for Strathbungo We have 4 hopper bins belonging to the shops in front of the building One belongs to Bradfords and it has not been emptied since it closed in July so can you imagine whats going on inside it as it is full I phoned the council about it but so far nothing has been done .Also many people just come and dump rubbish of all sorts next to these bins. The Strathungo Society would welcome the involvement of more people from the parts of the neighbourhood that don’t correspond to the conservation area. There’s no doubt that the east side of Pollokshaws Road west of Victoria overlaps with the location of the original village, and there’s a Strathbungo school on our side of the road, too. I agree 100% that we should get more people over here involved in the cleanup and in other, more fun, Strathbungo Society events, too.